Okay this isn't funny. But it could be. Three workers at a Deleware Daycare in Dover were recently arrested for holding their own little fight club. And by little I mean toddlers. Yeah, that's right they were coaching some baby boxers. Can you imagine a bunch of little guys barely old enough to walk and still in diapers being egged on to duke it out? Rumour has it one of them was named Dyler Turden. Ew. Messy. "Okay, I knocked him down. Now will you change my damn diaper?" Three employees of Hands of Our Future Daycare (I'm not kidding you, that's what it's called) were arrested after a cellphone video got out in which a three year-old can be heard crying and yelling "He's pinching me." The caregiver, while pushing him back up against his pint-sized pugilist opponent can be heard saying "No pinching, only punching." The daycare has had its license suspended pending a hearing. Serves them right. Everybody knows rule one of fight club is you don't talk about fight club. These guys have graduated to the hockey fight club. Thanks, Dufus... you just gave me a great idea for livening up my work days. 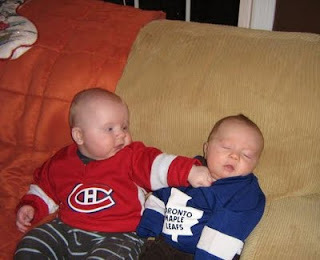 (Are those two hockey buffs your Thing 1 and Thing 2 in earlier days?) Seriously, though, it's good that place had their license pulled... just when you think you've seen it all, somebody comes up with something even more outrageous. When my son was three, he'd get a time out for yanking a toy out of another kid's hands. 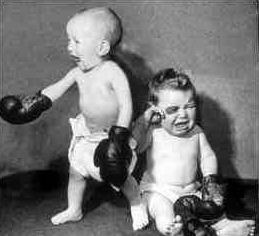 If only I had known about toddler fight clubs back then. The "Y" daycare was too politically correct. Seriously, what were those idiots thinking? At least make some money by taking bets. I knew somebody who's 5 year old broke another boys nose and his father patted him on the back and said "That's my boy!" I imagine that this would be something he would have admired. Okay, so I know this isn't funny, but holy cow, I can't stop laughing. What is wrong with you? Posting this where someone like me can see it? Of course I had to go find stories on this, too. I might have to write about this as well next time I do a news roundup of crazy stuff! no this is nothing like that. Although when these guys get sent to a corner I guess it's for a time out right? My Thing 1 and Thing 2 would have it all over any comers. Hey, maybe I could make a little money. Grat minds think alike, Lauren. I was thinking of training my grandkids. Sorry, Cheryl. I know this is terrible. But can you believe these people? And they call them caregivers. Well, this is one of the craziest things I've seen lately, believe me. Baby boxers. Huh. Just because they call themselves caregivers doesn't mean they are. Ignorant idjits. Then again, so are a whole bunch of people who gave birth and call themselves parents. I made fun of this but it's really too sad to be believed.